If you know any seniors who still haven’t finalized their college decisions, forward this guest blog by Jewel Walwyn, a professional college counselor. It’s April and you have done the hard part-or so you thought. On your desk at home, or your inbox, sits a cluster of acceptance letters from colleges! You are college bound, but the problem is, to which one. You carefully chose the colleges to which you will apply and are now faced with options. Options can be great, but you have less than a month to decide which college will help to steer you in the correct trajectory for the rest of your life. No big deal, right? As you and your parents ponder over and analyze your schools, here are some things to consider that may help to objectively compare the schools beyond that attractive admissions officer that plays the same sport you do! 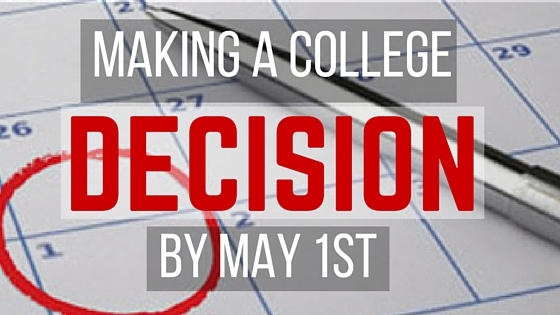 First, why May 1st: May 1 is National College Decision Day, so called because the vast majority of U.S. colleges and universities set this as the deadline for students to notify them of their decision to attend. This date determines if you will accept or deny that financial package that is coupled with your acceptance letter. · How many students stick around after freshman year? · How many students actually graduate? · How many students find good jobs after graduation? · Which school offers the stronger academic program in which I’m interested? · Are there extracurricular activities and social clubs that appeal to me more at one school than another? · What kinds of students enjoy attending this school? · If you haven’t already done so and the campus is nearby, visit the campus. A campus visit reveals far more about a college than any website will. · Go through the college’s website with a fine toothed comb. Read between the lines to learn about the college’s atmosphere and values. · Look over the school newspaper (most are available online). The school paper often offers a glimpse of campus life and available activities. · Access the course catalogue (if not available online, most schools will gladly provide one). If the school doesn’t offer interesting courses, you probably don’t want to attend. · Contact the admissions officers with any unanswered questions. People who work for the college may be biased, but they also know more about the school than anyone else. Compare Your Options Once you’re fully informed, it’s decision time. Choosing which college to attend is the first major life decision most students make – it’s a harrowing, terrifying, and exciting experience. Many students are tempted to make this decision purely based on emotion (i.e. “I got into my dream school! It’s expensive, but who cares?”), but this decision must be made in a logical and thoughtful manner. · Compare financial aid packages. This can be trickier than it sounds- rule out any schools that are too far beyond your family’s means. · Make a pro and con list for each school. Sometimes seeing all of the possible benefits and consequences in black and white can make the decision easier. · If you are still stuck, go with your gut. You will spend roughly 4 years living and studying at this school – ultimately, it is you who will have to decide what is right for you. · Send your Statement of Intent to Register and your deposit to your chosen college. Make sure to re-read all the materials that came from the colleges so that you submit every required document! · Notify the other colleges that you will not be attending. Many schools will already have sent a form that essentially asks you to “check yes or no” – if so, simply submit that form. If there was no form, notify the colleges in writing. Don’t feel obligated to include an explanation – a brief note stating that you have carefully weighed your options and decided to attend another school will suffice. Notifying your reject colleges might seem like a massive waste of time, but it’s the polite thing to do. There are hundreds (if not thousands) of other students on the wait list, and by notifying the college that you will not attend, you open your spot to another student. · Review any and all paperwork your college has sent. Make note of any additional applications and deadlines (such as housing applications). Check to see whether the college requests a final transcript, immunization documents, or other documentation and submit the appropriate documents in a timely manner. Jewel Walwyn, M.Ed. is a college counselor at School Counseling Group located on Mac Arthur Blvd in Washington, DC. With over 15 years of experience, Jewel guides students and families through the college process. She specializes in helping students with learning disabilities as well transfer students, adult students, and those seeking a gap year.